The Tipperary senior hurlers rounded off their challenge match series with a comprehensive 4-30 to 0-8 victory over Liam Mellows (Galway) All-Ireland club semi-finalists in Lorrha last Saturday. Michael Breen (Ballina) scored 2-2 while Ger Browne (Knockavilla-Donaskeigh Kickhams) added 1-2 with Noel McGrath (Loughmore-Castleiney) scoring the other Tipperary goal. John Tierney, Padraic Maher, Seamie Callanan, and Brendan Maher. That is it for now as the clock counts down to Sunday week when the opening salvos in the Allianz Hurling League 2018 will be fired in earnest as Tipp travel to Cusack Park in Ennis to take on Clare. In the second of their three challenge matches ahead of the league campaign the Tipperary senior footballers defeated Garda College, Templemore 1-19 to 1-10 last Tuesday night with Conor Sweeney (Ballyporeen) bagging the Tipperary goal. The final challenge match is this Tuesday night, January 16th again in Dr. Morris Park as Tipp welcome UCC to Thurles where throw in is at 7:30pm. Tipperary will play Cork in Round 1 Division 2 of the Allianz League on Saturday week January 27th in Páirc Uí Chaoimh at 5pm. Best wishes to Thurles Sarsfields who take on Killavullen (Cork) in the Munster Junior B Hurling Championship Final this Sunday, January 21st at 2pm in Raheenagh, Co. Limerick. Also, on Sunday best wishes to Cashel King Cormacs in the postponed Munster Junior B Football Semi Final against Cromane (Kerry) at 2pm in Knockaderry, Co. Limerick, the winners will play Ballybrown (Limerick) in the Munster Final on Sunday February 4th. 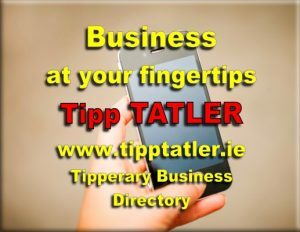 The quarter finals of the Dr. Harty Cup played last week brought mixed fortunes for Tipperary schools, with Our Lady’s Templemore winning by one point and Thurles CBS losing by the same deficit, scoring details as follows – Our Lady’s Templemore 1-14 John the Baptist CS 0-16 and Thurles CBS 1-11 Midleton CBS 0-15. In the other games the full times were Ardscoil Ris 3-20 Gaelcholáiste Mhuire 1-5 and CBC Cork 1-17 Coláiste Cholmáin Fermoy 1-12. Our Lady’s will now play Midleton CBS in the semi-final. Also on Wednesday, in the Corn Risteard Ui Mhathuna (18.5 C H) Quarter-Finals there was no luck for the Tipperary schools in action as Carrick CBS Secondary lost out to St Augustine’s 1-15 to 0-15 and Scoil Ruain Killenaule lost to Coláiste Choilm 1-16 to 1-11. Then on Friday it was an all Tipp affair in the Corn Thomais Mhic Choilm (18.5 B Hurling) Quarter-Final Replay with Cashel CS getting the better of Abbey CBS 2-14 to 1-12. Switching the attention to camogie, the highlight of the week goes to Presentation Secondary School, Thurles who were crowned Munster Senior A Colleges champions following a 3-5 to 0-12 victory over Coachford College in the final in Ballyagran on Saturday afternoon. An injury time goal from Grace O’Donnell saw the Pres emerge victorious for 2018 having lost the last two Munster finals. Congratulations to all involved and best wishes in the All-Ireland series. The 31th AGM of the Tipperary Supporters Club was a great gathering of Tipperary Supporters in the Anner Hotel, Thurles on Tuesday January 9th last. Bryan Maher, Assistant Treasurer, presented the detailed accounts for the year which resulted in grants of over €136,000 for expenses connected with the Senior Hurling All-Ireland campaign including medical treatment, specialist training, travelling and accommodation. Major sources of income were membership (€74,000), golf classics in Tipperary and Dublin (€43,000), sponsorship/donations (€21,000) and a Fun Run/Walk in conjunction with Tipperary Camogie (€4,000). Expenses such as the cost of membership gifts and postage of membership packs had been kept to a minimum. 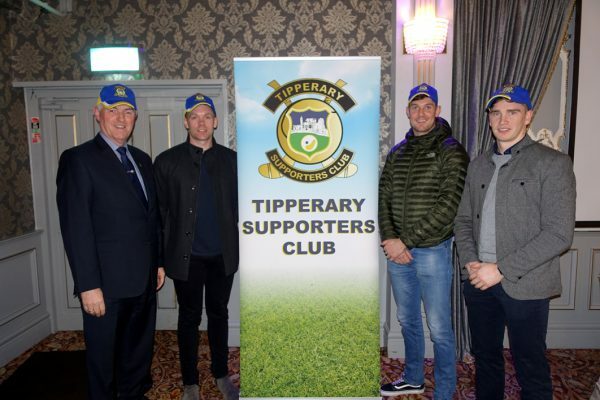 Pictured above right are John Tierney, Chairman Tipperary Supporters Club and Tipperary players Pádraic Maher, Seamus Callanan and Brendan Maher. John Coman, PRO, reported on a record year for numbers joining as adult members, and asked all members to make a special effort to encourage extra members to join up and to ask existing members to join using the direct debit facility. Members joining by direct debit will enjoy a special discounted membership rate of €30 for 2018. He reported that hundreds of members had already joined for 2018 with the member’s gift of the specially-produced Tipperary Supporters cap proving very attractive. In his address as Chair John Tierney thanked all the Tipperary Supporters for their generosity in supporting the fund-raising efforts of the Club. The following officers were re-appointed: John Tierney, Chair; Eamonn Buckley, Secretary; Bryan Maher, Assistant Treasurer; John Coman, PRO; and Jim Reidy was appointed for the first time as Membership Officer. John Tierney thanked John Malone for his work as Membership Officer in recent years. Two new committee members were co-opted: Ed Donnelly (Moycarkey-Borris) and Charlene O’Shea (Kilruane MacDonaghs). 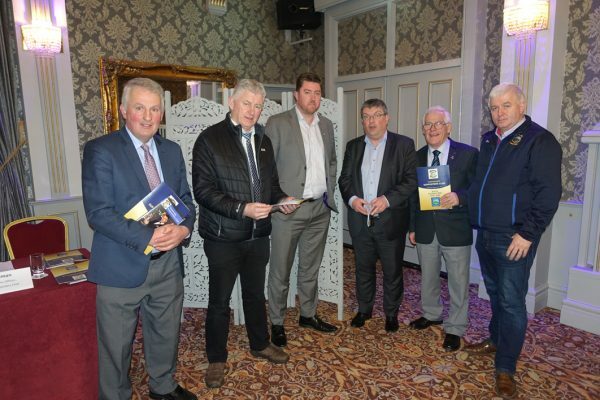 John Tierney congratulated John Devane on his election as Chair of the County Board and the meeting was addressed by John Devane who thanked the Supporters Club for being a vital element in the Tipperary Hurling set up. 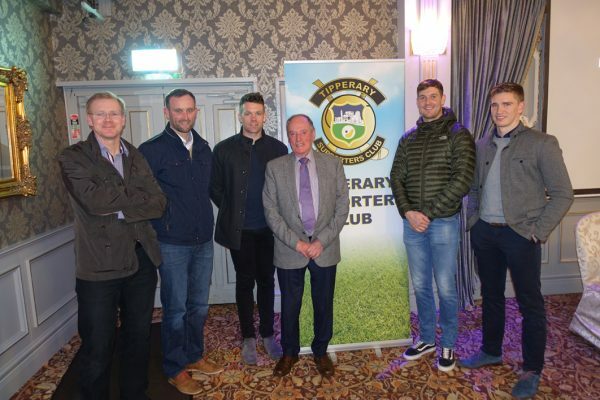 He commented on the great co-operation between the County Board and the Tipperary Supporters Club in their work, other County Board officials were also present at the meeting. Pictured left are John Devane, Tim Floyd, Bryan Maher, Ger Ryan, Sean Nugent and Michael Bourke. Finally, Conor Stakelum addressed the meeting on behalf of Michael Ryan, Senior Team Bainisteoir, who could not be present due to the recent death of his father Tommy, R.I.P. Conor was joined at the meeting by fellow selector Declan Fanning and players Padraic Maher (Captain), Brendan Maher and Seamus Callanan, and he brought an end to the meeting by thanking the Tipperary Supporters Club for their invaluable help which was an integral part of the Tipperary team’s preparation. Conor asked all Tipperary Supporters to continue to support the Club and explained that the players were already preparing well for 2018. Pictured above are Conor Stakelum, Declan Fanning, Padraic Maher, Michael Fenton (Tipp Dublin Association), Seamus Callanan and Brendan Maher. All photographs courtesy Gerry Ring. Club Officer Training nights have been arranged for 2018 as follows – Thursday week January 25th in the Anner Hotel, Thurles and Wednesday January 31st in Clonmel Park Hotel. An information night for all Club Children’s Officers and Designated Liaison Persons will be held in Thurles Sarsfields Centre (Upstairs) next Tuesday night January 23rd at 7.30pm. As Garda Vetting is now a legal requirement up to date information will also be given on the night. The Award 1 Football course will start next Monday, January 22nd and will run and over five nights inclusive. The course dates include January 22nd, 29th and February 5th, 12th, 19th all at 7.30pm – 9.30 pm nightly and the venue is Dr Morris Park. The North Tipperary Juvenile Handball Championship 40 x 20 Finals were hosted by Nenagh on Friday and Saturday January 5th and 6th last, following a number of quarter-finals and semi-finals which took place in the week preceding, with six clubs contesting the finals – Ballina, Ballinahinch, Lahorna, Nenagh, Newport and Youghalarra. The winners went forward to contest the County Finals in Nenagh last weekend. In those Juvenile 40×20 County Finals there was eight finals and some very close games, with the winners being as follows; Boys U10S Dean Carey (Ballina), U11 Singles Billy O’Brien (Nenagh), Boys U11D Emmet Jones & Stephen McNamara (Nenagh), U12S Stefan Tobin (Carrick On Suir), BU12D Charlie Grace & Sean Lyons (Ballina), BU13D David McGrath & Anthony Walsh (Cashel), BU16D Jack McGrath & Conor O’Dwyer (Cashel) and BU17D Ben White & Ross Moloney (Cashel). Congratulations and best of luck to all in the Munster Championships. 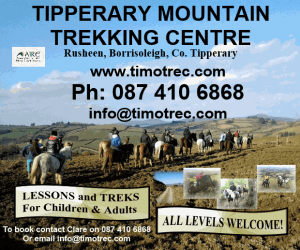 Tipperary had success out of two entries, both from Lahorna, at Gael Linn in Tulla on Sunday last – Jack Mulcahy and Hannah Grace won gold finishing on 125 points, Cork 2 finished second and Tipperary 2 finished third comprising of Ryan Gillick and Leanne Gould. This was played on a round robin format with 5 teams taking part. Well done to all concerned. The Cumann na mBunscoil Championships take place in Nenagh & Kilcoleman next Sunday January 21st. With entries from 13 National Schools it promises to be another great handball competition with the winners going on to contest the Munster finals in Broadford in Limerick on week ending February 10th/11th. The 48th Annual Awards Banquet of the New York GAA Minor Board will be held on Saturday, January 27th next at the Villa Barone, 737 Throggs Neck Expressway Bronx, NY 10465. Cocktail hour is from 7pm to 8pm with dinner and dancing from 8pm to 12am. Music is provided by the Cunningham Brothers. Admission is $100 for adults and $40 for children under-18. For further information, please contact any of the listed members below or visit us at nyyouthgaa.com all of whom thank supporters and friends for your continuous support. Dance Chairs: Caroline Martin 914-562-9657, Danny Browne 917-804-5880 & Dave Kilkenny 347-306-3857. Journal Chairs: Keara O’Connor 201-921-3398, Robert McDonagh 917-796-7954 & Gerry Loane 914-494-3509. Committee: Mike Brosnan 646-599-2395, Denis Twomey 347-680-0380, Dave Ryan 914-320-7316, Aidan Traynor 914-424-7818, John McCormack 203-651-9634, Pat Ryan 914-548-0484 & Paul Levins 347-386-0732.